Our approach is to use best quality ingredients and stick to only natural, non-GMO products for your dog. Anxiety and pain relief in a cheese and bacon flavored treat your dog will love! A perfect match. This food topper super supplement calms anxiety, reduces pain, and alleviates itchy skin due to allergies. 100% unrefined coconut oil formulated for your pets allows you to supplement your pups diet with a natural super-food! Adding coconut oil to food is a delicious treat your dog will love, all while relieving allergy problems naturally. Can also be used to treat skin issues topically. 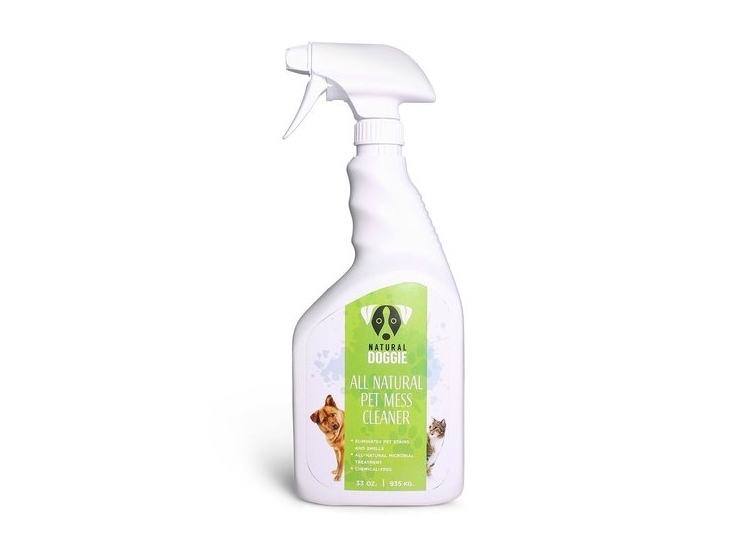 A revolutionary cleaner that is odorless and chemical free! This new technology removes all traces of stains and odors due to urine and it is all natural, GMO free and made in the USA. Wild caught Alaskan Salmon oil from Natural Doggie promotes better mental and physical health for your pup. Rich in omega 3s, this formulation is a supplement to their food that is certain to improve skin/coat and immune health overall. This oil is a natural anti inflammatory and will help any dog with skin issues or allergies live a more comfortable life. This organic CBD oil can be applied topically or orally and will assist your dog in confronting anxiety, joint and mobility issues, allergies, pain, and inflammation. Derived from Hemp, this non-psychoactive oil is sure to give your dog the relief it desires.